Below is another article which I have recently written for the Muslim Academy site which is run to increase East-West understandings. If the first church of St. Paul was to be destroyed or the house of Mary, mother of Jesus, were to be razed to the ground there would be a near universal outcry; yet events of a similar scale are happening in Saudi Arabia with hardly any protest whatsoever. In the last 10 years, there has been the state-sanctioned destruction of 500 historical sites, according to Dr. Irfan al-Alawi, who heads up the Saudi Islamic Heritage Research Foundation. However, there have been only muted protests by most countries as governments of most Islamic countries are wary to criticise in case it hinders the passage of their citizens through Saudi Arabia, whilst western states remain silent for fear their limited access to archaeological sites in the country may be withdrawn altogether. This is part of a 2 prong attack on historic sites. The Saudi government is determined to showcase Mecca as an ultra modern city full of skyscrapers, gaudy hotels and expensive shops in a manner lacking any style whatsoever let alone in line with the expectations of the majority of pilgrims when they visit Mecca and Medina. This backed up by the strict Wahhabism who believe that antique sites and shrines encourage the practice of “Shirq” or polytheism and as such they should be destroyed. Recently mountains have been dynamited along with an Ottoman era fortress and 95% of Ottoman era buildings including family homes. What is more, the house of Khadijah, the first wife of Prophet Muhammed has been converted into a toilet block. 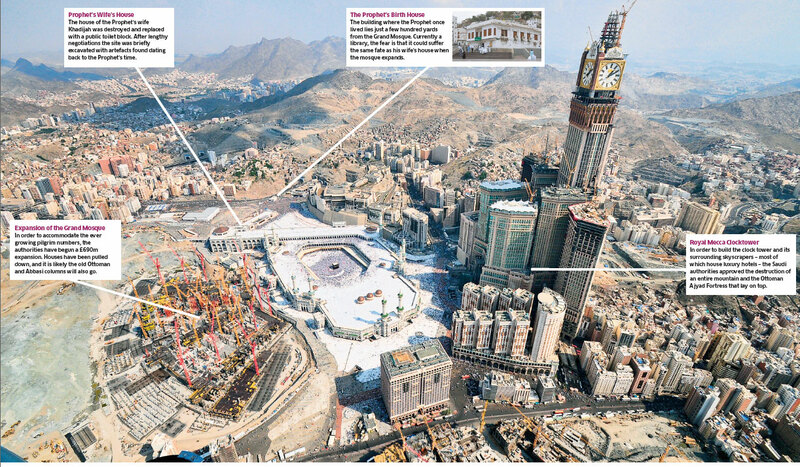 Three ancient mosques are at imminent risk in Mecca and Medina as are areas of the Grand Mosque and the house of the Grandson of the Prophet was dynamited over 10 years ago to celebrations of the local religious police. In the whole of the huge country of Saudia Arabia, is this spot next to the Grand Mosque the best place for tacky and tasteless architecture? Despite billions of pounds of Saudi aid spread around the world in a bid to promote their particular creed, only a tiny minority subscribe to the Wahhabi beliefs. Many mosques which were both ancient and architecturally speaking beautiful and in keeping with their local culture have been replaced by expensive though culturally ill-fitting and austere Saudi style mosques. However, the House of Saud is powerful due to its wealth and underground connections which deter criticism from any meaningful Islamic politician. In many ways they are similar to the Puritans who ruled England for that brief period when England was a republic following the beheading of King Charles I by Oliver Cromwell. Then anything deemed religious impure or distracting was banned or destroyed with even Christmas Day itself being said to be banned though this is thought to be largely a myth. Saudi Arabia is increasingly full of bland and tacky tower blocks built over builds of actual historic and aesthetic value. The Bayt al-Mawlid, the birthplace of the Prophet which may soon fall under yet more skyscrapers. 400 year old Ottoman columns in The Grand Mosque, some of the oldest remains but infuriatingly to Wahhabis inscribed with the names of the companions of The Prophet. Al-Masjid an-Nabawi in Medina containing the grave of Abu Bakr and Umar which Saudi officials have confirmed as being idolatrous and needing to be destroyed. This is the second holiest site in Islam and incredibly important religiously and historically and yet threatened by demolition. 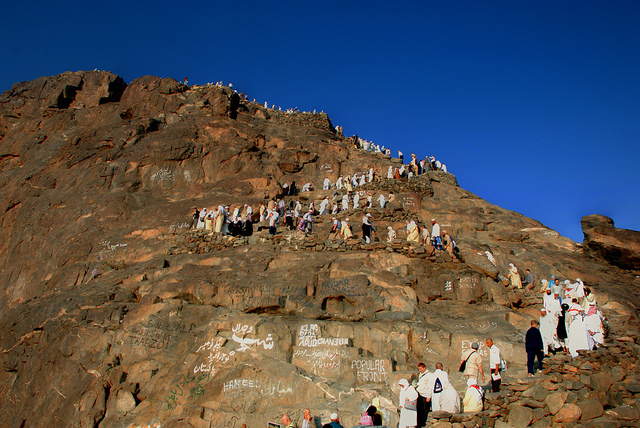 Jebel al-Nour, the mountain outside of Mecca where Muhammed received his first Koranic revelations. Unlike in other countries where it is common to visit or pray at shrines and mausoleums, this practice is strictly denied to visitors to Saudi Arabia who want to visit any historic monument. The Hira cave is especially popular with Muslims from Asia and Saudi officials are keen to stop congregations gathering here with solutions including bulldozing the steps up the mountain or even blowing the mountain up being considered. 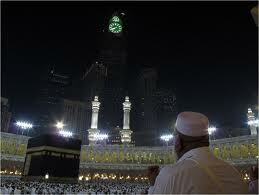 Visitors to Mecca re-visiting the footsteps of the Prophet Muhammeds but for how much longer? Surely this is cultural and religious vandalism? 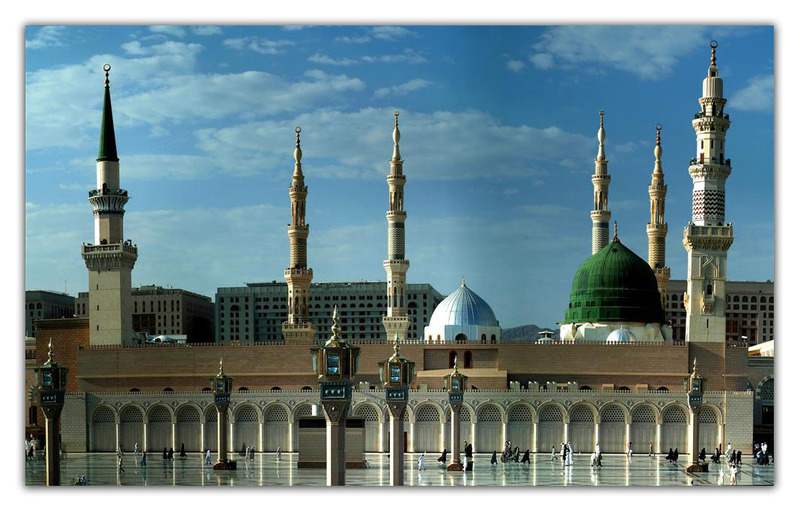 These sites though do not belong to Saudi Kings and princes but to all Muslims, to all people of the world. The world has been rocked by protests of much smaller insults to Islam by individuals in America or Israel but does it make everything acceptable if the acts are perpetrated by the Saudi state? This entry was posted in Culture, history, News, Politics and tagged Architecture, cultural vandalism, Culture, history, Islam, Mecca, Middle-East. Bookmark the permalink. A great shame – reminds me of the Taliban blowing up ancient Buddhist statues in Afghanistan. Your comment “The world has been rocked by protests of much smaller insults to Islam by individuals in America or Israel but does it make everything acceptable if the acts are perpetrated by the Saudi state?” is particularly telling. Yes it is. It’s lucky no-one else is like this or else there would be a lot less things to see. This was a fascinating article, to say the least. My impulse is always to take the side of the Saudis when I can as they were most courteous hosts to me during my time there, however, facts are facts, and your analysis is fair. The House of Saud cannot afford to look anything less than united, but there are clear factions, some who would not agree if they could do so, but the policy is by no means universally agreed to. The fear may seem irrational to us, but Saudis really are scared of idolatry, in a way that certainly does not cross the minds of Muslems from other parts of the world – even Christmas trees or anything resembling one are banned – though they are technically illegal in Israel as well. I agree with you. but understand where the Saudis are coming from. However, if they want to take that all the way, they have to also remove the you-know-what,starting with K.
The modern buildings and hotels…yes, I know about that…that is straight forward cash flow…inwards I mean..as we all know! It certainly an interesting kingdom and yes the Saudis I have met have always been courteous. 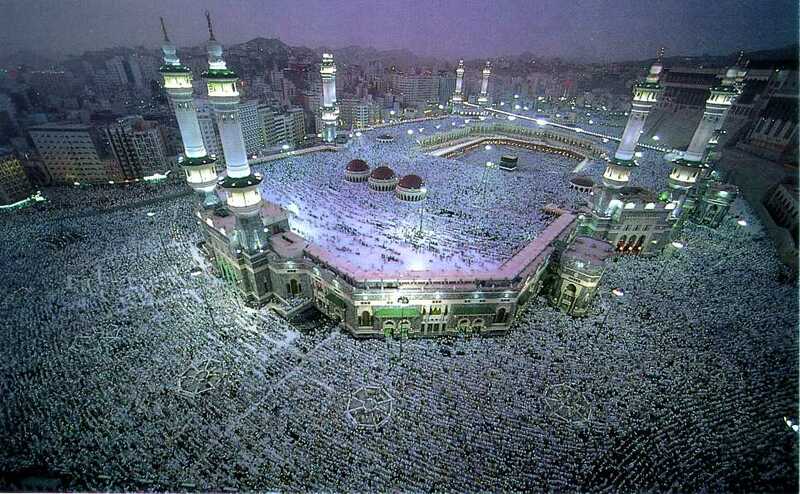 I would very much like to visit Mecca one day…. somehow. I can’t see it becoming an open country for tourism even as much as Iran is for as long as their is oil. It is just such a shame that their changes are permanent whilst the current ideas of doing this are only 150 or so years old. There is a big chance that people in the future will wonder what were there ancestors thinking. As a muslim I get hurt reading about those foolish tribal rulers who are so far away from the civilization that gave so much to humanity…. Its also quite unfortunate that powerful western governments protect tribal regimes whose madness springs sectarian clashes and bloody wars in the region and beyond. It is very unfortunate. I am sure that in years to come the Western policy to back such states will look as bad as supporting Apartheid in South Africa or the Soviets siding with Nazis. It is not something I am happy about or support in any way at all. Same as it’s said in the comments, one asks himself what will saudis think of this in…. who can say…. 30 years?, 50? from now, when many things change (I think they are about to change in next decades) and young people asks for the recovery of their real roots. History is a great teacher, and I am sure that future generations of muslims and saudis themselves will complain for the behaviour of these wrongly called “wahabbis” (http://saudiwoman.me/2008/08/28/what-does-being-wahabi-mean/) who spread their “hanabillah-ism” in a way that is familiar to us, westerns (Inquisition, Puritanism,…) Only a few buildings of the arab period were respected in Spain and they are considered jewels, nowadays, and a huge fortune. In my hiomeland, the arab heritage is made of food, town and village names, agriculture traditions… but nothing else that could sound “too muslimized” survived the spanish catholic integrism of those golden XV to XVII centuries. I am catholic myself. And I repent of the huge damage made to my country’s cultural heritage by those who understood religion in such a way. A lesson to be learnt by many muslims nowadays… and also by many jews, christians, buddhists,… Wrong ways are not an exclusivity. Now…. read abt what’s happening in a place where people doesn’t move a finger to avoid it, while worried abt women’s right to drive, work, travel… Learn and enjoy. I agree. I am convinced that future generations will be disgusted at the actions of the current Saudi government. It is just another version of Puritanism. People need to know it isn’t our responsibility to destroy things just because they are old or we don’t like them. We’re just looking after the planet until the next generation take-over and who are we to say what they should or shouldn’t see. In England, so many beautiful buildings were destroyed by King Henry VIII when he started his own Protestant Christian religion. Many others were Anglicised either by him or the Puritans. In my local Cathedral at St. Albans it is beautiful inside but nearly all white stone. Recently though they have started removed the “modern” plaster work to reveal the much more colourful wall paintings and decorations from when it was a Catholic church and everyone is happy to see them. Saudi Arabia is turning into another cloned country of skyscrapers and shopping centres but even in very modern lands like Japan and the United States, they still respect their historic and religious sites. I would love to visit some of the Arab buildings in Spain but it money means it isn’t going to happen soon. As a lover of antiquity and the artifacts thereof, I’m saddened by this. I was unaware of these developments. Thanks. Well as any Saudi would tell you to your face – it’s their country, it’s their religion and it’s their culture. Your concern or otherwise is of no matter to them. I am surprised it has not been bombed, it will be bombed. want to follow the footsteps of the prophet and pray at his cave, are simply following the religious nature within all humans given by God himself. Wahhabi Islam is similar to Protestantism in the west. Protestants defaced and destroyed any revered Catholic icons they could get their hands on and attacked the holy places. It ultimately comes from these people not understanding God is a person, with love for those devoted to him. God is reduced to some cold impersonal power, whose only emotion is anger and jealousy. It is sad to see. Turning Khadejahs home into a toilet is extremely disrespectful to the Prophet, but the fools think this is pleasing to God. I’d just like to imagine what would happen to Italy’s art (I live in Italy) if a christian form of wabbabism took root here. What would happen to St Francis chuch in Assisi with its Giotto frescoes or any of the thousand-plus sanctuaries this country has? I find what is happening with historical sites in Saudi Arabia absolutely unpardonable. It’s certainly a country which won’t have any world heritage sites worth thinking about in it soon. It is true, what a crime to humanity they are committing. Once their oil runs out they might regret not having anything to attract visitors even from Muslim nations. I’d dread to think what would happen in Italy if such a thing happened and what a awful impact it would have on our reputation of Italy. We’re quite fortunate considering the wars of the last century that apart from a few notable exceptions in Poland, Germany and Britain. we managed to avoid the cultural destruction in wR that the Saudis are inflicting in peace. Fascinating and a real eye-opener. I was aware that most of the Arab world hates Saudi Arabia but didn’t know why – I presume this is the main reason? Perhaps the only reason? Yes that is probably the main reason but there are a few related ones. The other Arabs traditionally looked on Arabia as backwards and are still resentful to them being influential due to oil. Egypt, Iraq, Syria and other places all had great empires and centres of learning but what is Saudi Arabia never really did. Like Christianity, where ever Islam goes it tends to blend in a bit with the local cultures and religions so Islam in Africa can be quite different from that in Afghanistan but the dominant group in Saudi Arabia just can’t tolerate that. An other thing to bear in mind that just like the USA or Russia often only give aid or money if it is spent in a way that helps the donor country, Saudi Arabia does the same and so all of these mosques and schools and cultural centres are being built all across the Islamic world from Saudi money but it is a way for the Saudis to bring in a foreign and very specific version of Islam across the world that eventually brings round lots of the locals. No doubt that is why many if the extremists in London and those involved in 9/11 were from Saudi Arabia. I’d like to visit there one day but not for modern Saudi but for some of the great ruins in the country, most from pre-Islamic times but the most beautiful Islamic buildings in the peninsula now are probably in Yemen and Oman and I’d much rather go see them first which is lucky as they let tourists into their countries unlike their bigger neighbour. That’s really interesting, Steven. Thank you for this info – I haven’t found any other explanation on line of this. Really appreciated! If you’re self taught, you’re a very good teacher!!! And now I see, no wonder you have so much insight into the Middle Eastern situation. I’d love to read more posts on that from you… hint hint! Thank-you! Even my wife forgets that I never studied British or European history, not even WW1 apart from the Middle-Eastern bits. I have been backpacking around the Middle-East a few times and met some great characters (see my Lawrence of Arabia 2 posts). If you want some Christmas reading you might like my Timeless trilogy historical novels which are all Middle-East and Central Asian related or Planes, Trains and Sinking Boats for my funny travelogue which is like being there without the bribes and dashes to the loo! Maybe I will write some posts on some of the lesser known locations and some more newsy-history posts too. I actually did my Masters in the Arab-Israeli war which as you can imagine was jumping into the deep end. I received death-threats from both sides and this being in the 90’s before everyone got worried about such things, my professor told me that if you get death threats from both sides then you must be pretty much spot-on. Anyway I have to be careful if I ever go to Gaza or Brooklyn! The loss of anything historic, even by overshadowing with large buildings, is always a huge loss. However, I think the description of the Mecca clocktower as tasteless and tacky is a little unjust. It’s an absolute masterpiece. It’s placement is what is unfortunate.